Steve Jobs' amateur sleuthing last night brought up that gorgeous TweetDeck chart showing the vast variety of Android handsets out there, which the Apple CEO used to illustrate the "daunting challenge" he perceives developers have to face when creating apps that work across all devices and OS builds for the platform. Only problem with his assertion (aside from Steve calling the company TwitterDeck)? 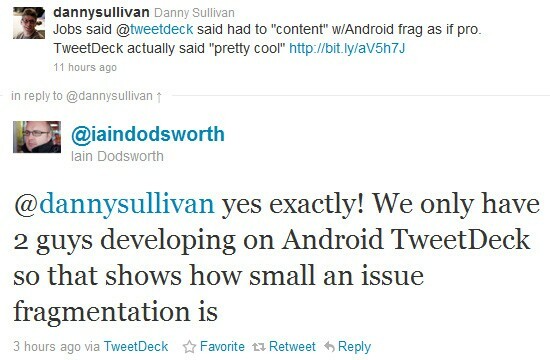 His opposite number on the TweetDeck team thinks nothing could be further from the truth: "we only have 2 guys developing on Android TweetDeck so that shows how small an issue fragmentation is." So that's Andy Rubin and Iain Dodsworth, any other company chief interested in taking Jobs down a notch?